Tuesday 16th July for me now will always be Pete´s Day. I don´t like whiskey, in fact just the smell of it makes me heave, but I´ll look at a bottle now on this day and think of my mate, our mate Pete Morris. 16th July, the day we said goodbye to a true gent and genius. In 2013 the UK was covered in wall to wall sunshine with temperatures soaring. It was more than a two day Summer. Traffic oddly was good and the journey from Essex to Leicestershire took just under 2 hours. We were first to arrive in the quaint village of Narborough, Pete´s spiritual home. Having found the church, neatly tucked away off the High Street, tea and poached eggs on toast from the little village cafe settled the stomach. The service was at 11-00am and slowly people starting arriving. The church was splendid and one day I´ll revisit and have a proper look around. No doubt I´ll have another chat with Pete and tell him how it all went. The place reminded me of the church in the film Hot Fuzz, although it wasn’t quite as big. 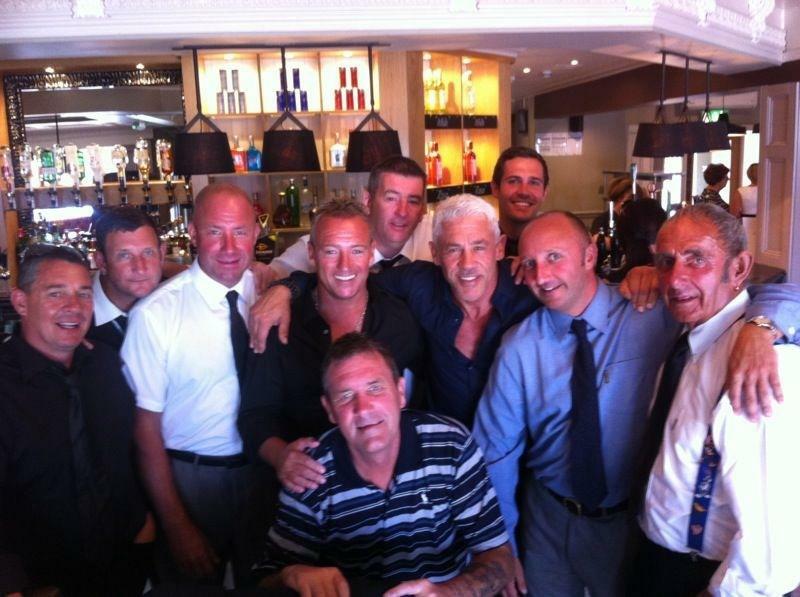 Being part of the Lineker family, there was a security guard hovering around, although I sincerely don’t know why. Yes Gary was there with the family but there was more than enough weight around to see off any unwanted onlookers, and to be honest, it just wasn’t like that. The church also reminded me of the magnificent one in Waltham Abbey on a smaller scale. Sailing was playing as we entered and took our places. As services go it was as pleasant as can be, the vicar was great and Wayne Lineker produced a fantastic speech about Pete´s life that was both sad and funny but made everyone smile. It was a fitting tribute for sure. Myself, I worked hard to keep my emotions in check as I have done on many an occasion such as this. The odd thing was I was smiling most of the time as the sense of occasion for me wasn’t like any other. I tend to cringe when Vicars, Priests whatever start to preach about marching into heaven and going to a better place and stuff like that. I´m there to pay my respects of course but in all honesty I don’t wanna hear that stuff, I want my friends here! Anyway I´m probably not explaining that very well so I´ll move on. This guy today was good and so refreshing. Songs sung and prayers said, everyone filed out gracefully and that was my biggest moment. I was last to leave and they were playing Sailing again. As I turned round I saw a montage of photos on canvas of Pete. Cue the tissues. The Loros* place done good that day. I had to drive like Hamilton to keep up with the cortege to find the crematorium, Gilroes, which was splendid in the sunshine. The committal was pretty brief, as they are. Myself and Mark Noble noticed the shelf around the outside and said it would have been a great touch if whiskey shots were placed around the outside for everyone. Sorry Pete, I still wouldn’t have drunk it! Abide with me always put a lump in the throat and this was no different. It was back to Narborough and the Dovecot Pub for the wake. At the pub it was like a mini reunion as the solemn mood changed and the memories came flooding back. Stories of bar building, bar boozing and bar crawling came out as the Linekers lads all put their two pennies in. Everything and everywhere from Puerto Banus to Cyprus and back was discussed, even Pete´s dodgy knee! Each person had their own story to tell and the time flew by. I read reviews about the pub elsewhere as well and they were non too complimentary but everything was fine today, the Fosters was cool as you like and going down far too easy. Moose and I were starting to re enact the past and I remembered the car outside. There´s something about talking about the past and here was a great bunch of people talking about it. I paused for a moment and said “the one person who should be here with us talking about all this is not here” Everyone smiled and we raised our glasses once more for Pete.